A second new restaurant coming to NW 65th Street! More big news coming from NW 65th Street! Janet Eicher & Cameron Johnston, owners of West Woodland’s own Chocolat Vitale, are scheduled to open a new restaurant in Spring 2016. This husband and wife team opened Chocolat Vitale five years ago at 6257 3rd Ave NW, a stone’s throw from their new venture – joli. joli will open at 618 NW 65th Street. This space has been an under-used retail location for many years, hidden behind iron gates, and serving as a ground floor residence for about a decade. 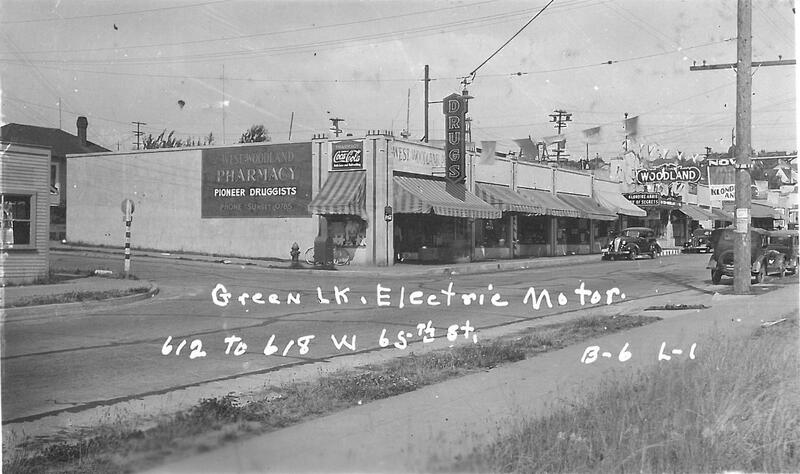 When the building first opened, this retail store front was home to the West Woodland Pharmacy. Photo of West Woodland Pharmacy, dated 1937, courtesy Vintage-West Woodland. Janet and Cam’s vision is to make joli an inviting neighborhood kitchen and to bring downtown dining to NW 65th Street in Ballard. The menu will reflect French, Italian and Mediterranean influences with a nod to the Riviera. Using the best ingredients from here and abroad, the restaurant will feature French and local wines, house made pastries, and artisan chocolate. Now for the $30,000 question! Like many restaurant projects, Janet & Cam are building joli with their own financial resources and sweat equity. This is your opportunity to support joli, by joining the restaurants Kickstarter campaign. Read more about what is coming progress to date! Join the joli Kickstarter campaign here! This entry was posted in Uncategorized and tagged ballard, chocolat vitale, joli, phinney ridge, Restaurant, west woodland by West Woodland, Ballard. Bookmark the permalink.